If you’re like all the members of our family, you probably love fresh baked bread. There’s just nothing like it. It’s so soft and fluffy, especially when it’s just warm out of the oven. And, nothing in this world smells as good as homemade bread while it’s baking and right after you take it out of the oven. You won’t be able to keep your family away from it. if you bake it early in the morning like we did, it’ll certainly help get the kids out of bed on time for school. That fresh bread smell works better than an alarm clock. Most people, however, are really intimidated by the idea of baking their own bread. That’s why baking homemade bread in a crockpot is such a great idea! 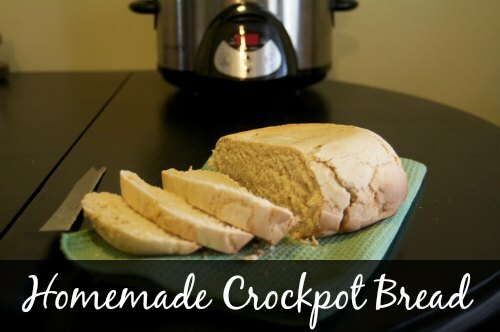 This method of baking homemade bread in a crockpot lets the bread rise as well as bake simultaneously. It’s much preferred to the tedious process formerly involved in baking bread. First, it took several hours for the dough to rise. Then you had to punch it and let it rise again. Then, you still had to bake it. When you make your homemade bread in a crockpot, the entire process only takes a couple of hours from start to finish. The recipe we found online for homemade bread in a crockpot comes complete with step-by-step instructions and pictures that will make your mouth water. The directions are clear and offer helpful tips along the way (e.g., make sure your yeast has bubbles when it’s proofing – if there are no bubbles, start over with new yeast so that your bread will rise properly) so that you will get an ideal loaf of bread on the first try. So, treat your family to delicious homemade bread in a crackpot and get them running to the table whether you’re serving it for breakfast, lunch, or dinner.